MACOM Enabling Rapid Transition to 400G for Cloud Data Centers with L-PICTM Chipset | MACOM Technology Solutions Holdings, Inc.
LOWELL, Mass.--(BUSINESS WIRE)-- MACOM Technology Solutions Inc. ("MACOM"), today announced the production ready MAOP-L284CN, MACOM's 100G CWDM4 transmitter L-PICTM (Lasers integrated with a Silicon Photonic Integrated Circuit) and supporting driver and controller IC chipset. To meet the bandwidth demands, resiliency and data redundancy requirements of today's Cloud Data Centers, data center optical interconnects are transitioning from 100G to 400G, driving explosive demand for high-speed optical links. MACOM's demonstration shows the platform's PAM-4 CWDM4 capability of uncooled operation at 400G at distances up to two kilometers on single mode fiber. These devices leverage key MACOM technologies optimized for high port density applications in Cloud Data Center applications. The demonstration will transmit 100G PAM-4 over a single lambda with the L-PIC platform at OFC 2017. "We have moved quickly to leverage the proven success achieved with EFT lasers to other platforms. 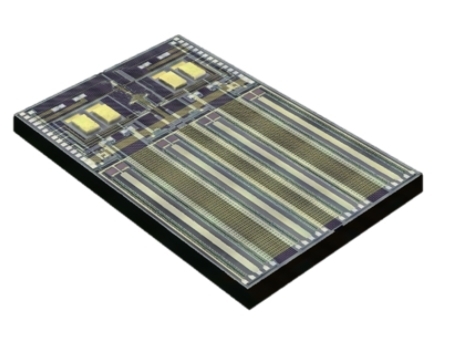 Using EFT, we enabled the seamless integration of the TOSA optical path including lasers, monitor diodes, modulators and multiplexers onto a single chip, yielding the industry's first silicon photonic integrated circuit (PIC) integrated with self-aligning lasers (L-PIC) for 100G," said Arlen Martin, Director of Product Marketing, Silicon PICs, Lightwave Networking Components, at MACOM. "By solving the key challenge of aligning lasers to the silicon PIC, maintaining high yield and high coupling efficiency, MACOM is making the adoption of silicon PICs a reality for the high-speed, high density optical interconnects demanded by Cloud Data Centers OEMs." MACOM's L-PIC device combines four high-performance distributed feedback (DFB) laser diodes using MACOM's patented Etched Facet Technology (EFT), four 28G Mach-Zehnder optical modulators integrated with a coarse wavelength division multiplexer, monitor photodiodes and a high-performance output coupler for operation on one standard single mode fiber. Using MACOM's patented self-aligning etched facet technology (SAEFTTM) for precision attachment of the lasers to the SiPh L-PIC, this device enables customers to bypass optimizing optical coupling with active alignment and curing, offering instead an integrated single device that reduces manufacturer assembly time and component cost. The MAOP-L284CN L-PIC transmitter is available as part of a complete MACOM chipset platform, including the MAMF-011095 silicon PIC controller and the MASC-37053A high-speed, low-power modulator driver. Optimized to work together, this chipset solution offers customers improved performance, eliminates the need for assembly of discrete components, reduces configuration and test costs, and accelerates time to market. With the recent acquisition of AppliedMicro and their PAM-4 technology, MACOM is extending the L-PIC transmitter platform to support 200G and 400G switch-to-fiber applications. MACOM will feature demonstrations of its L-PIC based CWDM4 chipset solution and 100G over a PAM-4 single lambda on the L-PIC platform at OFC 2017, Booth #1736, March 19th-23rd in Los Angeles, CA. To make an appointment, contact your local sales representative. For more information on MACOM's broad optical and photonic portfolio visit: www.macom.com. MACOM is a new breed of analog semiconductor company — one that delivers a unique combination of high growth, diversification and high profitability. We are enabling a better-connected and safer world by delivering breakthrough semiconductor technologies for optical, wireless and satellite networks that satisfy society's insatiable demand for information. Today, MACOM powers the infrastructure that millions of lives and livelihoods depend on every minute to communicate, transact business, travel, stay informed and be entertained. Our technology increases the speed and coverage of the mobile Internet and enables fiber optic networks to carry previously unimaginable volumes of traffic to businesses, homes and Data Centers. Keeping us all safe, MACOM technology enables next-generation radars for air traffic control and weather forecasting, as well as mission success on the modern networked battlefield. MACOM is the partner of choice to the world's leading communications infrastructure and aerospace and defense companies, helping solve their most complex challenges in areas including network capacity, signal coverage, energy efficiency, and field reliability, through its best-in-class team and broad portfolio of RF, microwave, millimeterwave and lightwave semiconductor products. MACOM is a pillar of the semiconductor industry, thriving for more than 60 years of daring to change the world for the better through bold technological strokes that deliver true competitive advantage to customers and superior value to investors. Headquartered in Lowell, Massachusetts, MACOM is certified to the ISO9001 international quality standard and ISO14001 environmental management standard. MACOM has design centers and sales offices throughout North America, Europe, Asia and Australia. MACOM, M/A-COM, M/A-COM Technology Solutions, M/A-COM Tech, Partners in RF & Microwave, The First Name in Microwave and related logos are trademarks of MACOM. All other trademarks are the property of their respective owners. For more information about MACOM, please visit www.macom.com, follow @MACOMtweets on Twitter, join MACOM on LinkedIn, or visit the MACOM YouTube Channel. Any express or implied statements in MACOM product announcements are not meant as warranties or warrantable specifications of any kind. The only warranty MACOM may offer with respect to any product sale is one contained in a written purchase agreement between MACOM and the purchaser concerning such sale and signed by a duly authorized MACOM employee, or, to the extent MACOM's purchase order acknowledgment so indicates, the limited warranty contained in MACOM's standard Terms and Conditions for Quotation or Sale, a copy of which may be found at: www.macom.com/support. MACOM Technology Solutions Holdings, Inc. (www.macom.com) supplies key enabling technologies for the Cloud Connected Apps Economy and Modern Networked Battlefield. MACOM is a global company serving a wide variety of markets across multiple geographies. It is only by embracing and cultivating the richness that diversity offers that we best serve our customers and increase shareholder value. Comprised of different perspectives, backgrounds, cultures, lifestyles and experiences, MACOM is a new breed of semiconductor analog company; one strengthened by the richness of our employees’ differences. We’re committed to enabling a better-connected and safer world, driven by our innovative technology and products, and enabled by the wealth of our diversity.